The Purana is a distinct branch of learning. It is treated as one of the Vidyas like the Samkhya and the Vedanta, it has its distinct theory of cosmology. The major Puranas are considered to be eighteen in numbers, known by Maha puranas are considered to be eighteen in numbers, known by maha-puranas. 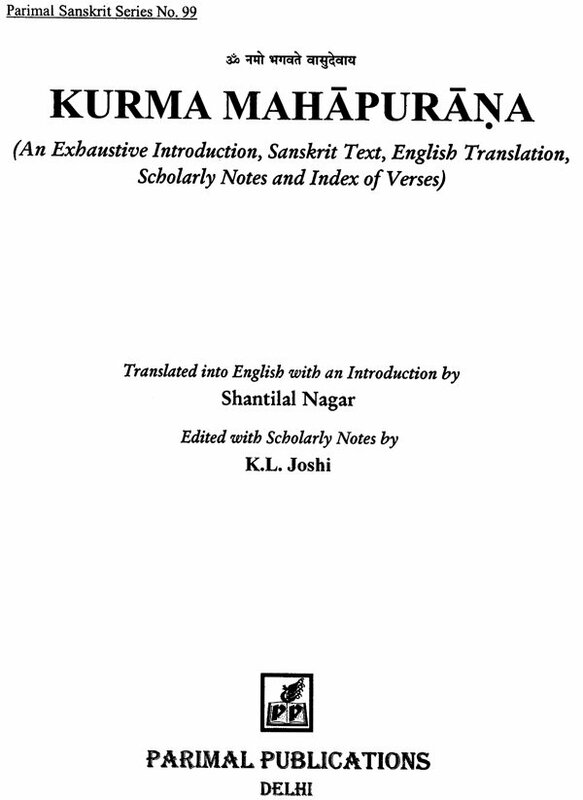 One of the important Purana among the eighteen Maha-purana is kurma Mahapurana, in which the narrator is Lord Visnu himself, in the form of a kurama (tortoise). 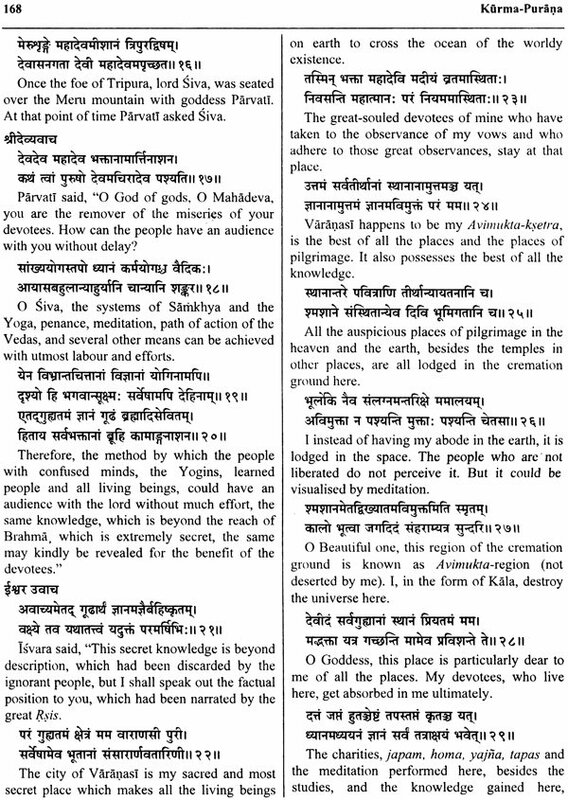 Kurma Purana is divided into two sections, viz., Purava-bhaga and Uttara-bhaga. There are various stories in this Purana, full of great learning’s. Initially, the origin of Prajapatis, the duties of the of our Varna’s and ht source of the livelihood of each of the varnas has been described. Similarly, the characteristics of Dharma, Artha, Kama and Moksa have also been spelt out. The characteristics of the great devotees, their conduct, the diet etc. and the characteristics of the castes and stages of life have also been added in this Purana. Thereafter, the primordial creation, the seven coverings of the Anda (cosmic egg) and the origin of Hiranyagarbha have been related in this purana. Thereafter, there is the description of periods and unit of time in this Purana, in addition to the glory of Isvara, Sleeping in the waters by Brahma, besides the relative interpretation. 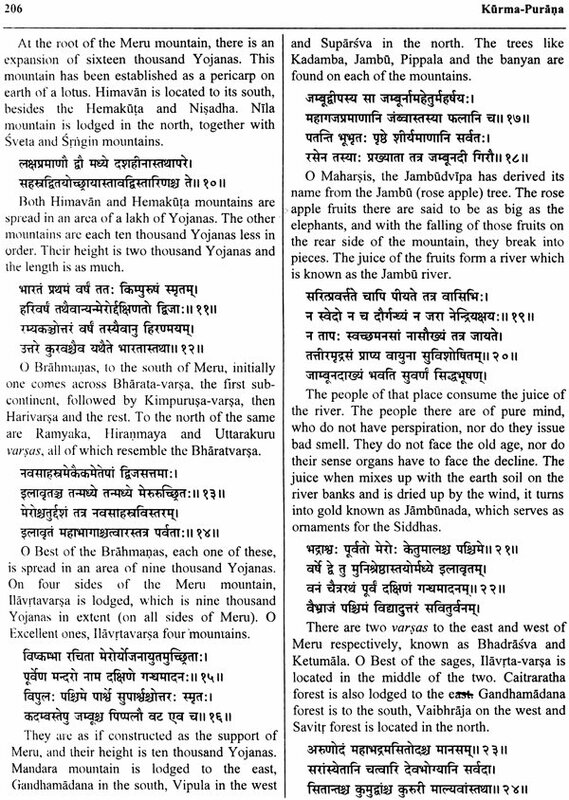 Thereafter, there is the mention of the form of the Bhuvanas (world), the position of the planets and the constellations, besides the mention about the rivers. AT last, ther s the mention of procedure for a person for getting relieved of all the sins, and getting established in the Brahmaloa. 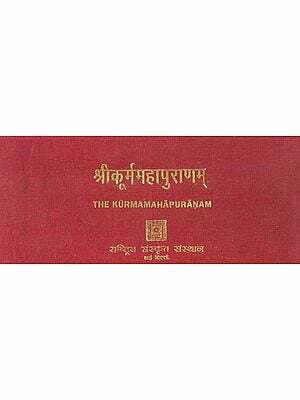 This is for the first time that an English translation of kurma-Mahapurana has been produced with complete Sanskrit text side by side. 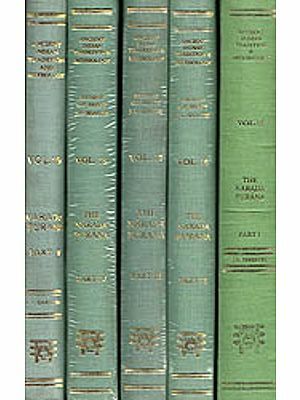 Further, there is a detailed Introduction and an Index of verses at last for the generous readers and researchers. Various references at appropriate places have been added for ht benefit of the readers. Lord krsna in Bhagavadgita has declared that whenever the dharma is on the decline and there is the uprising of adharma, then I for the up lifting of dharma incanrnate on earth.for the protecionof ht enoble people and for the destruction of the evil people, I incarmate on earth again an again in each one of the yogas. Accordingly, lord, Visnu had been incarnating on earth ins everal forms. The number of these incarmnation of vinsu is a matter of debate. The glimpses of the number of various incarnations of Visnu, as brought out by the different Puranas is recorded here under. Of the aforesaid ten incarnations of Visnu, the first four have to tier credit a single time performance. As for example, Matsya-the Fish appeared simply forth protection of all the species of the world when he had to float through the waters of deluge. Similarly, the kurma incarnation had to serve as a base for ht churning rod at the time of the churning of the ocean. Indeed in the absence of kurma the process of churning of ocean could never have taken place. Because it is he who could held on to the Mandara Mountain. This incarnation too is represented in a nanimal from as well as the composite from in Indian art. Numerous representations of kurma are found in the Dasavatara Panels. One of the most interesting sculpture of lord kurma is preserved in the Bharat kala Bhava, Varanasi, in which he is shown as a huge tortoise with well round shell and a rather long neck placed over the pedestal. A striking feature of this sculpture is the emergence of a small four armed visnu holding the usual attributes out of ht neck of ht tortoise. The right leg of the god is firmly placed and the left leg is folded to give an impression of its emergence out of the tortoise. In the pradaksina-patha of the Laksmana temple, Khajuraho, visnu is projected over a tortoise in yogasan, with to lower hands in yoga mudra and the remaining two hands holding a disc and a mace. A beautifully carved stone image of kurma from karitala, Jabalpur district of Madhya Pradesh, depicts the tortoise in quite a realistic manner .Its head is missing. The neck is decorated with beautiful bead and strips with floral design. A headless female, possibly Laksmi is found seated in front of tortoise. Closely there as another figure which is completely damaged. The image belongs to the eleventh century A. D.
A miniature from Mandi, depicts a four armed Visnu, holding his attributes in his four hands is shown slaying the demon Svarabhanu. 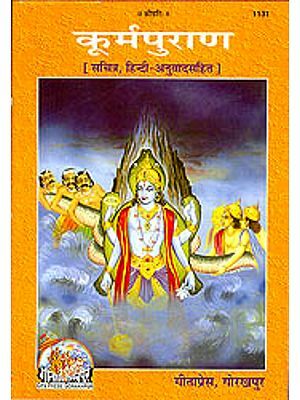 The most interesting aspect of Visnu here is that he is shown in a composite form of ahalf human and half tortoise moving in the oceanic water. The Matsy and Kurma incarnations of Visnu of the late medieval times are found at Ariyallur, evolved to facilitate the sculptural representation. The upper half f the image is human while the lower half of it takes the form of fish or tortoise. Tracing the antiquity of the kuma incarnation of Visnu one has to refer to satapatha Brahmana wherein it is stated that Prajapati took to the form of a tortoise in order to restore the worldly creation. (And as to its being called kurma (tortoise)- Prajapati, having assumed the form, created living beings. Now what he created, the made, and in as much as he made-kear, he is called kurma, and kurma being the same as Kasyaa (kachhapa) a tortoise, therefore all the creatures are said to have descended form kasyapa). In the Bhagavata Purana it is stated that Visnu assumed for supporting on its back the mountain used for the churning of the ocean in order to obtain nectar for the gods. This was the joint of the demons and the gods in which both of them applied their utmost force. It was not an easy job because for the purpose of the churning rod Mandaracala Mountain was used, while Vasuki serpent, served the purpose of the churning rope. Bit inspite of making all the arrangements, the base to lodge the bottom of the churning rod was required. Then , lord Visnu in order to make the event a success not only served as a tortoise to hold onto the and Mandara mountain, but also in another form seated himself over the top of the shaft to prevent it from shaking. As a result of this, the following fourteen treasures emerged out of the ocean after the churning of the ocean. 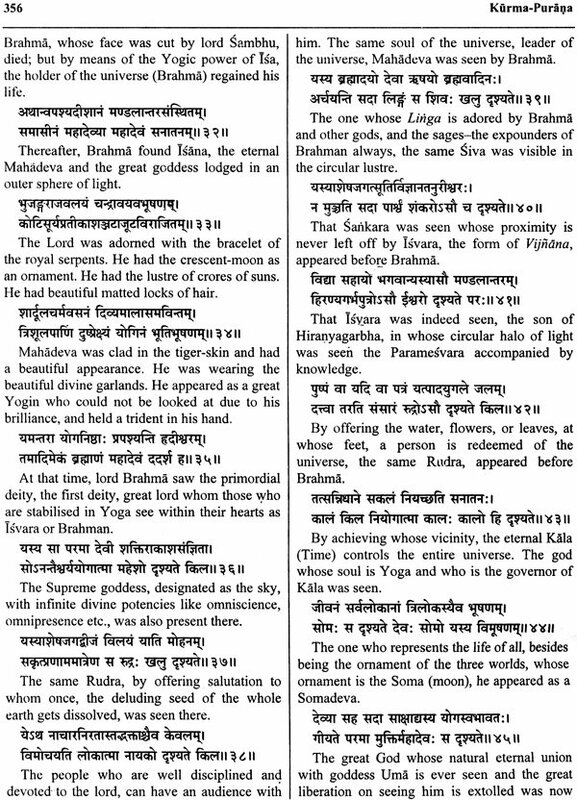 Listening to these eighteen Puranas, the sages have composed other literature known as Upa-Puranas. The name of these Upa-Puarans and the names of their composers are given here under as brought out in verses 1.17-20 of kurma Purna. Indeed the Purana is a distinct branch of learning. 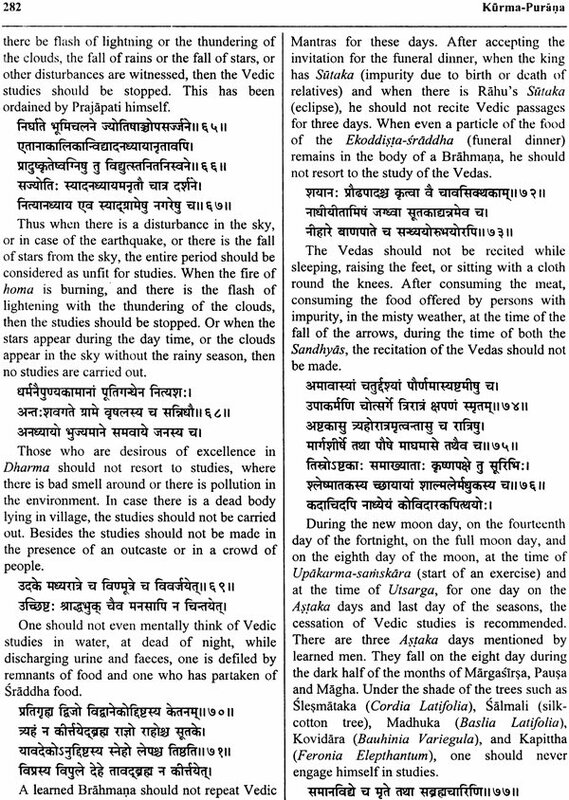 It is treated as one of the Vidyas like ht Smkhya and he Vedanta, it has its distinct theory of cosmology. Moreover and besides the five times (Sarga-Pratisarga etc.) mythology is also the special feature of Puranas. 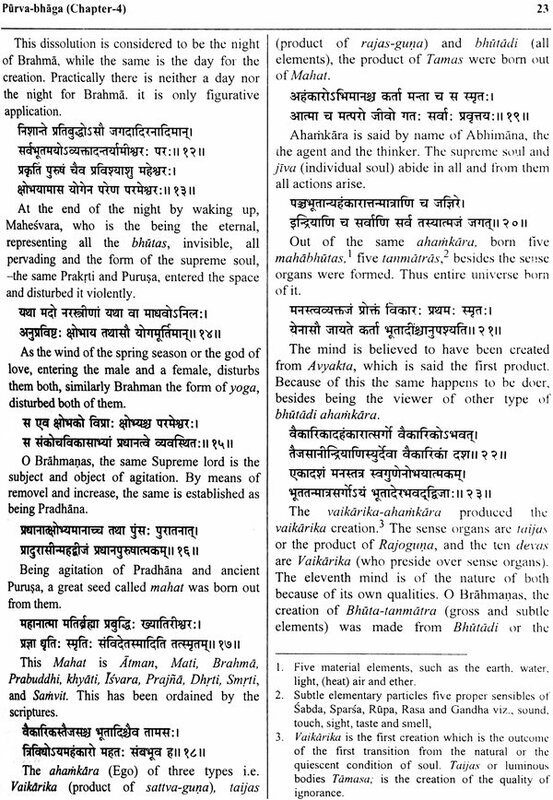 Cosmology and mythology, are the two main subjects of Purana-Vidya. Just as the Puranaincv cosmology can be best understood of the knowledge of cosmology of ht various philosophical systems of India, in the same way the Puraninc mythology can best be understood in the light of the knowledge of the comparative mythology. Often the germ of a Puraninc myth could be traced in the Vedic texts-both Samhitas and the Brahmanas. 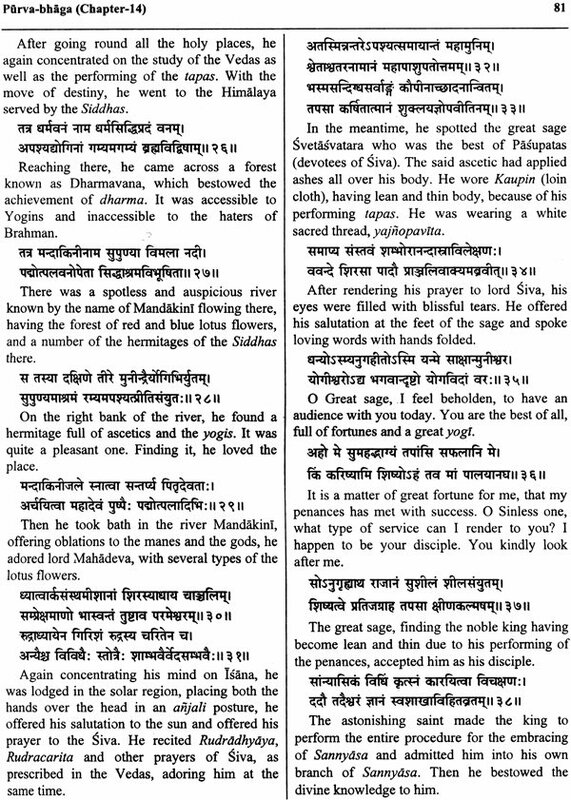 Many of the legends narrated in the different Puranas, Epics or even the Buddhist Jatakas are inter-related. Not only this, similarities in the Indian conceptions as pointed out by William Jones, are found between ancient India and Greeco-Roman Mythology. The full import of the Pauraninc myth therefore, can better be realized with the study of the comparative mythology. A study of the various Puranas would reveal that they have been classified at Sattvika, Rajasik and Tamasika Puranas variously in the Padma Purana as well as Bhavisya Purana , a bird eye view of which is provided here under. It may be added here thath broadly speaking he Sattvika Puranasa mainly glorify Visnu, the Rajasika Puranas glorify Braham, while the Tamasika Puranas glorify Agni and Siva. There is another class of the Puranas, which glorify Sarasvati and Pitrs. One of the important aspect of this Purana has been that it narrates a thousand names of Paravti besides describing her iconographical features. 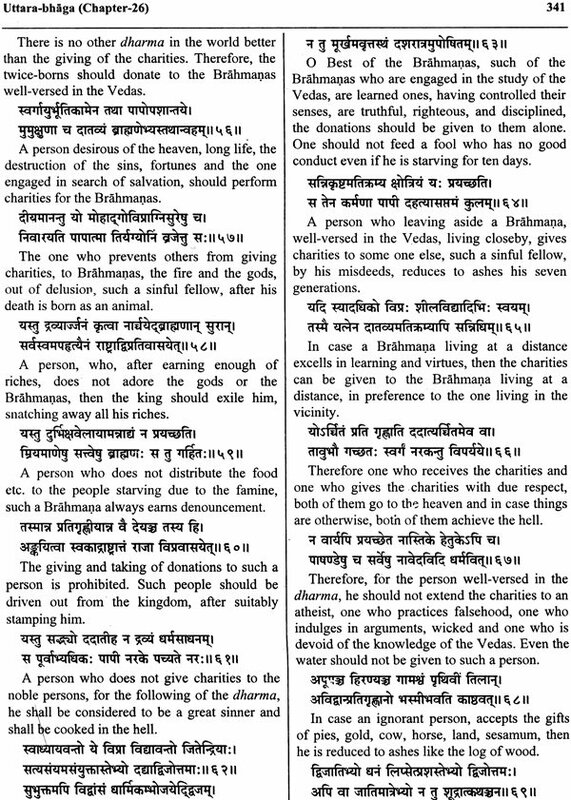 Chapter-15 of this Purana,deals with the destruction of the sacrifice of Daksa. This episode has been quite popular with the poets or the writer had developed the story in his own way. Daksa one organized a sacrifice in which Siva and Sati were not invited. Siva was omitted because of the stigma of a kapala attached to him. Because of this, Sati too was not invited. Jaya, a friend of Sati came to see her and informed her of the sacrifice being organized by Daksa. This news of her being slighted by her father shocked her, then she went to her father uninvited, where she after having been insulted by her father ended her life there itself. Then at the instance of Siva, all the Sivaganas with Virabhadra went to kaakhal near Haridvara. A grim battle was fought between visnu and Virabhadra in which Virabhadra swallowed the Cakra of Visnu , who left the place. Virabhadra then severed the head of Daksa and dropped it into the sacrificial fire. Siva ultimately reached on the s pot and at the prayer of the gods, the head of Daksa was replaced with the head of a hegoat. Brahma in chapter-15 of the Purva-Bhaga of the kurma Purana had advised Daksa that such of the people who think Siva to be separate from Visnu they are overpowered with delusion, and such people being averse to the Vedas fall in the hell. Such of the people who are devoted to the Vedas consider Rudradeva and lord Visnu as one, as a result of which they achieve salvation. The one w ho is Visnu, he is Rudra as well and the one who is Rudra is Janardana also. Indeed it was not at all a one-sided affair, even Visnu had the same feelings for Siva, who was always adored by the lord of Laksmi. In fact whenever Siva was in difficulty Visnu came to help and whenever Visnu was difficulty, Siva saved him. Chapter-20 of the first half of the kurma Purana deals with Ardhanarisvara form of Siva. This form of Siva has been a popular one with the artist as well as poets, who had variously patronized the same. Ardhanarisvara is the form of Siva in which the god is depicted with his consort Parvati in a single human body depicting the left half of a female and the right half of a male. This form of Siva has been described in various Puranas with minor deviations here and there. 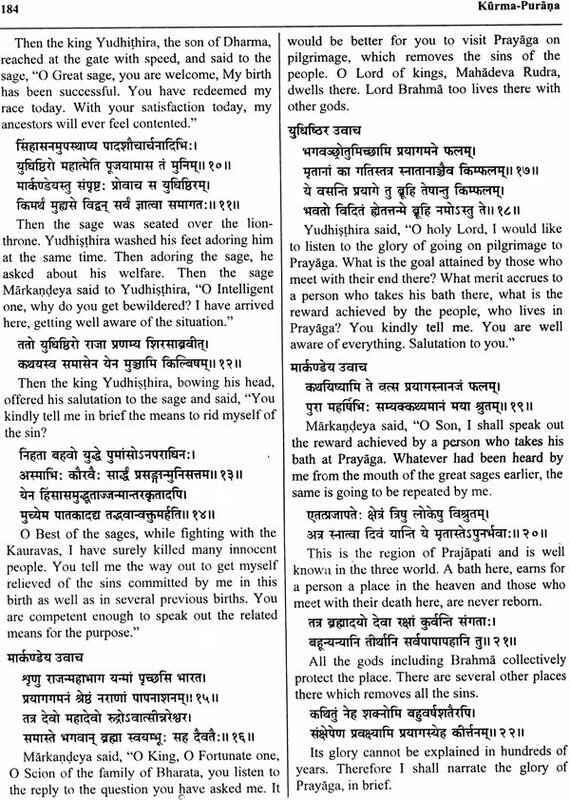 According to this text, initially Brahma could create only Prajapatis. He therefore felt concerned with the slow progress of creation, because unless there were females how could the creation proceed? He, therefore, contemplated on Mahesvara who appeared before him in the form of Ardhanarisvara-a composite form. Braham then realized his error and prayed to he left of Mahesvara to give him a female to proceed with the duty of creation. The request was granted and the creation of the world went on thereafter. 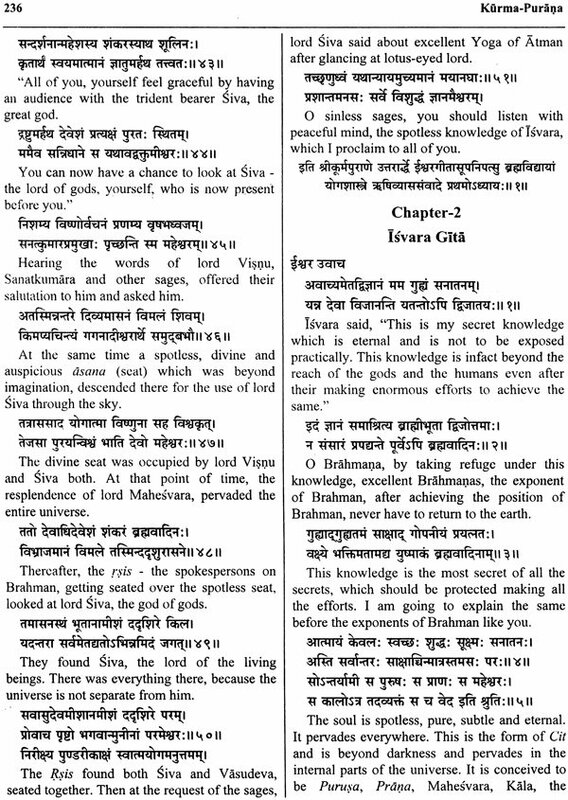 Rudra, Siva and Visnu are the creators of this world according to this text. Both comvined are form the Ardhanarisvara aspect of Rudra. Both the male and female principles are inseparable and are ever found together in the cosmic evolution, which happens to the real form of Ardhanasrisvara Haryardha form of Siva. (iii) Another Purainc account dealing with the Ardhanarisvara form of Siva interprets in this form of Siva, an attempt to amalgamate the two cults of Siva Sakti. While the germs of this syncretistic ideology are found in the episode variously descried by Puraninc seers, in which Bhrini’s single minded devotion to Siva has been highlighted. His single minded devotion forced Lord Siva to take to the form of Ardhanarisvara. But he adamantine imprudence of Bhrngi would not allow him to pay homage to any deity other than Siva, much less to his consort. The sage therefore assumed the form of a beetle, cut a hole through the composite body and circumambulated the Siva-part only, to the great wonder and astonishment of Parvati, who ultimately was pleased with the devotion of the sage to Siva. The ArdhanarlsvaramurtI of Siva in a way symbolise the syncretic ideology, for they apparently emphasise the union of the principal cult deities of Saivism and Saktism. It is true that the ideological union of Siva and Sakti, the primaeval parents of the universe, has been delineated by many early and late texts, but that sometimes, though rarely, separatist tendencies lurked in the minds of exclusive worshippers of the two deities is also testified by literary data. Gopinath Rao relates a story about this Ardhanarls'vara form of Siva, which seems to suggest the presence of such a tendency. On one occasion the Devas and Rsis circumambulated Siva and Parvati at Kailasa (the abode of Siva), but the Rsi Bhrngl being an exclusive worshipper of Siva went round the god of his choice alone, neglecting to go round or pay homage to the Devi. She grew angry at this insult to her and reduced the sage to a skin-covered skeleton, and Bhrngl was unable to stand erect on his two skinny legs. Siva took pity on him and provided him with a third leg, which act of grace was thankfully acknowledged by the sage. But to save also Parvatl's honour, Siva united his body with her, in order that Bhrngl would be compelled to pay homage to the goddess, while paying his respects to him. Thus originated this Ardhanarls'vara form, but such was the tenacity of this sectarian sage that assuming the form of beetle, he cut a hole through the composite body and circumambulated the Siva-part only. The story is no doubt naive, but in a way it lays stress on the exclusive tendencies of sectarianism, which have been finally overcome (in the case Bhrngl of the story this was still present) according to the Puranic myth-maker by such a composite form of the god and the goddess. The iconic motif of Ardhanarisvara, however, was evolved at a fairly early period, long before such explanatory myths came to be fabricated, and glyptic and sculptural evidence regarding the existence of such motifs in Northern India as early as the Kushan and Gupta periods. Two south Indian reliefs of the Chola period illustrate this composite form, one from the Brhadlsvara Temple, Tanjore, and the other form Darasuram. The one from Tanjore shows the three-armed god standing reclining in a slight tribhanga pose on Nandl, his right half being male, and the left half, female. Of the two right arms, the back hand holds a trisula, the front one being in the varada pose; the one hand of the Parvati half holds a nllotapala flower. The dress and ornaments of the two halves of the body are different in as much as they are made to befit a male and a female. The composite god shown in Darasuram relief has many novel features such as three faces, eight arms, a big halo behind its three heads, and he stands in the samapadasthanka pose without Nandl behind him; some of the eight hands hold an aksamala, a khadga, a pasa, a darpana, the objects in the other hands (one left hand is broken) being indistinct. The male and female halves are clearly demarcated as in the other relief. Rao remarks about this exceedingly interesting and extraordinary piece of sculpture. In no Sanskrit work that has been examined do we meet with a description of Ardhanarisvara which agrees with this image.. ..' (op.cit., Vol.11, p.332). The multiplicity of hands and faces of this image cannot be satisfactorily explained, but the faces may emphasise the ugra, saumya, and Uma aspects of the god. But one thing worthy of note in this connection is that in none of these reliefs the urdhalinga feature of the composite god is present, which is very often found in such figures of Northern and Eastern India. 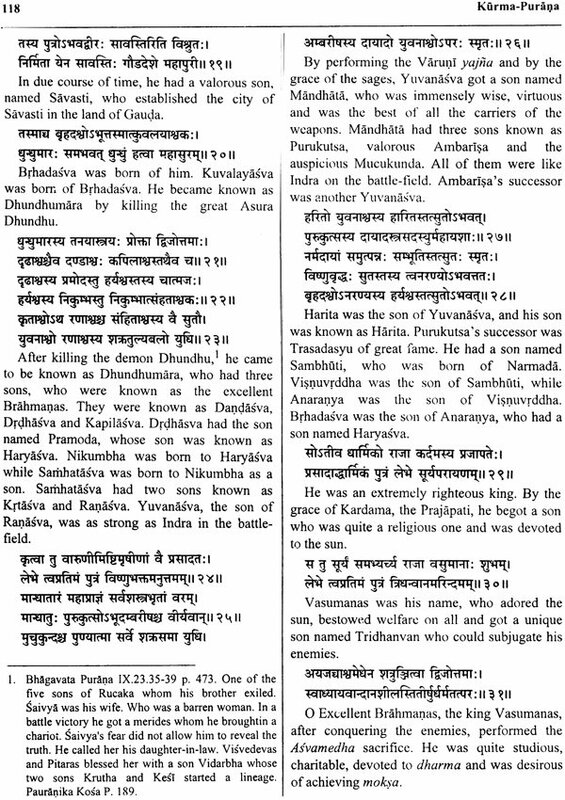 The Mahabharata contains an account according to which Visnu needed cakra, possessed by Siva, to slay some asuras. With this end in view Visnu sat in adoration before a Sivalinga and on each day he offered one thousand lotus flowers to the god. One day when Visnu sat worshipping Siva, he found at the end of it one lotus flower missing from the required number of one thousand. Actually Siva secretly took it out in order to test the strength of the devotion of Visnu. Visnu is known as kamalalochana - one having lotus eyes - and he immediately plucked out one of his eyes and offered it to Siva, who was ultimately pleased and granted him the cakra. The Ultarakdmikagama and Srltattvanidhi describe this form of Siva similarly with minor deviations. According to the first authority, Siva shoVild have three eyes, four arms, a pacific appearance and be decorated with a jatdmukuta on the head. The left leg should be bent and resting on the seat, while the right one should hang down. He should hold a tanka and a cakra in right hands while the left ones should project a varada pose besides holding a black deer. To the left of Siva, ParvatI should be seated and on the right Brahma should be standing. Visnu with hands folded in anjali pose, should be worshipping or offering puja to Siva with lotuses and his eyes. Srltattvanidhi is not particular about the tanka in the hand of Siva but provides parasu as an alternative. In this text, Visnu is required to be standing to the left to Siva in such a manner as to indicate his readiness to receive the boon, the cakra, after finishing his pujd of Siva with his lotus eye. Siva should be depicted as presenting Visnu with a pltambara, the kaustubha and a cakra. Visnu should be black in colour, clad in yellow garments and adorned with all the ornaments. In two of his hands, he should have a sankha and a cakra, while the other two hands be held in anjali pose. 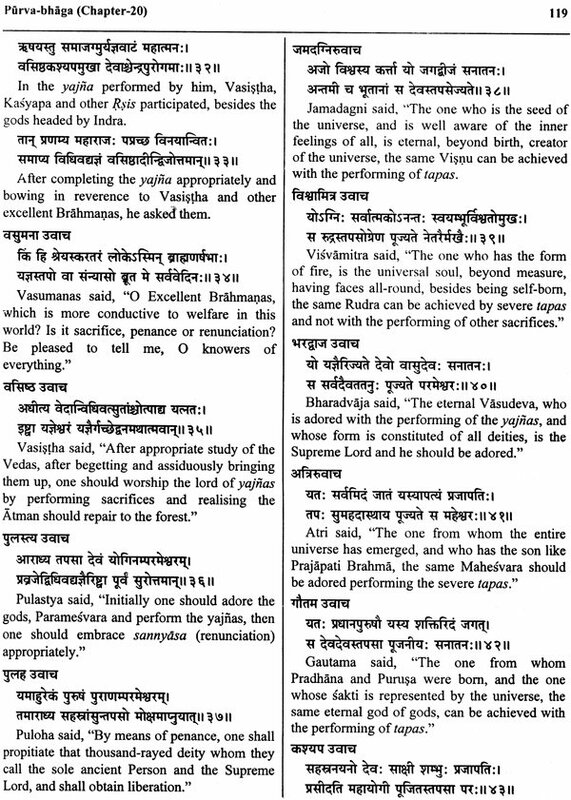 The Vamana Purana contains the reference to Cakraddna by Siva to Visnu (ch. 82). The cakra according to this account is described as similar to kdlacakra. (Vamana Purana, 82.23-24) This form of Siva is variously represented in Indian plastic art. A panel in the Kailas'anatha temple at Kanjeevaram illustrates Siva as sealed on a raised seat with ParvatI, having his two back hands raised in astonishment. The right front hand rests on the seat and the other left hand is held in simhakarna pose. Behind Siva stands an attendant, and below the seat, Visnu is kneeling down. With one of his left hands he is plucking out his eye. The other left hand holds the last of the lotus flowers, while one of the right hands is held in kataka pose and the attribute of the other one is not clear. A similar scene is available in the Meenaksi Sundres'vara Temple, Madurai. A painting from Kangra depicts, Siva as CakradanamurtT. Siva in this case is shown with five heads and seated over a double-petalled lotus. Each one of the heads have three eyes. He has four arms, each carrying a mrga, & parasu, cakra and varada pose. Snakes serve him as his ornaments including the necklace. ParvatI is seated to the left while NandT appears in the foreground. Visnu, four-armed stands to the right and is about to receive the cakra from Siva. His two hands are joined in anjali pose, while the other two joined together are about to receive the cakra from Siva. (Panthey Saroj, op. fit., p.49, pi. 34).